11:2 and said to them, “Go into the village ahead of you, and immediately as you enter it, you will find tied there a colt that has never been ridden; untie it and bring it. 11:6 They told them what Jesus had said; and they allowed them to take it. 11:7 Then they brought the colt to Jesus and threw their cloaks on it; and he sat on it. 11:8 Many people spread their cloaks on the road, and others spread leafy branches that they had cut in the fields. 11:9 Then those who went ahead and those who followed were shouting, “Hosanna! Blessed is the one who comes in the name of the Lord! 11:11 Then he entered Jerusalem and went into the temple; and when he had looked around at everything, as it was already late, he went out to Bethany with the twelve. The first time I ever heard about Palm Sunday, I was confused. I’ve talked before about how I didn’t really grow up in the church, so I went to my first Palm Sunday service during my senior year of high school. You might remember that I grew up mostly in Florida. And we had palm trees everywhere. We had a bunch all around our yard, and we would climb them the way kids in other places climbed oak trees. At Christmas some people even put their Christmas lights up on them. And when it was time to clean up the yard, we had to cut those branches down all the time. And I remember there being so many that we would fill up trash bag after trash bag and then haul them to the curb for the trash truck. So, to be honest, growing up I thought Palm Sunday must be some sort of local Florida celebration like a Blueberry or Apple Festival, and I had no idea why we were celebrating it in church. I understand what Palm Sunday is all about now. I know it’s the entry into Holy Week. And, because there are no palm trees here in southern New England, every Lent we pay a company to send us a box of palm fronds. The same kind we had way too many of in my neighborhood growing up. That irony is not lost on me. But palm leaves, they’re an essential part of this story today. Scripture tells us the Palm Sunday story in two places, John and Mark, both of which we read this morning. And in them we hear about how Jesus, who had been preaching and teaching all over the surrounding towns for the past few years, gaining followers and generating excitement, was finally walking onto the biggest stage of all, the one where he was set to become a legend in his own time: Jerusalem. Now, it may not sound like much to us today, those palms and those shouted “hosannas”, but back then they were greeting Jesus like he was a rock star. He was unlike anything they had ever seen before. Because the palm fronds they were waiving were more than just green leaves. At that time you waived palms as a symbol of victory or triumph. They were literally signs of hope, being held high for Jesus and all to see. And those shouts of Hosanna literally meant “save us!” Because the people who were gathered by that road, they needed saving. They were being brutally oppressed by the Roman Empire on one hand, and held down by religious leaders who didn’t always want what was best for the people on the other. And the people who were there believed that Jesus had come to change all of that, maybe even by force. They didn’t know what was coming, but they knew it had to be better than what they had always known. But by the end of the play those same actors, that same crowd, is shouting something different. When Pilate tries to release Jesus instead of killing him, the same crowd that shouted “save us” on Sunday is shouting back “crucify him…crucify him” on Friday. I don’t think that Andrew Lloyd Webber wrote the scenes that way because he didn’t have enough actors to play two different crowds. I think he wrote them that way because he knew that sometimes, even with the best of intentions, our fears get the better of us, our hopes seem misplaced, and our loyalties fail us. It was about the time that I saw that concert that I realized that it wasn’t enough just to refrain from actively participating in injustice. I realized that in order to be truly faithful, we have to make a decision to not just stand by and watch it happen. Because when we are a part of a crowd, and we do not speak up, in so many ways we may as well be yelling “crucify him” with the people around us. When we see a bully terrorize someone, and we do nothing, we are not siding with kindness. When we watch someone being harassed, and we don’t dare to speak up, we are not being allies to them. When we see injustice happening around us, but we think we have no power to change it, we are a part of the reason that injustice can thrive. At least, that’s what they thought. But that’s a story for next Sunday. For now, though, I’ll just say this. He did not save them in a way that anyone expected. There were no weapons and no wars. But a victory was coming. One that deserved all the palm leaves in the world. But one that no one in the crowd that day could ever imagine. 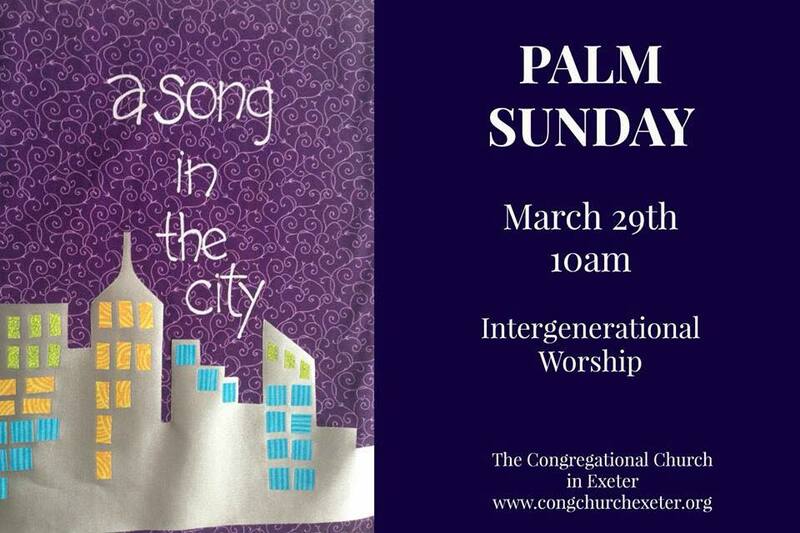 So, for those of us 2,000 year later, in a place where our only palms are shipped in from another country, and in a time where with 20/20 hindsight we know how this story ends, how do we shout “hosanna”? And how do we welcome Jesus into our midst today? Between you and me, while the palm leaves are nice to have, I don’t think Jesus much cares what we are waiving when we decide to welcome him. Here in New England we could do the same thing the people of Jerusalem did all that time back and just use what is handy. So we could use maple branches, or pine boughs. Or snow shovels, if you prefer. We could throw confetti or shoot off fireworks. Or, we could do one better, and just open our hearts, and on this Palm Sunday, invite Jesus in. And we could say “hosanna”. “Save us”. From whatever it is we need to claim victory over in our lives, from whatever struggles we are facing. From whatever is keeping us as just one of the crowd, and from being a disciple. Hosanna, Lord. Save us. Let’s start the welcome today. But let’s not end here. This week we will be journeying with Jesus through Holy Week, from today to Maundy Thursday, and from Good Friday until Easter Sunday. Step out of the crowd. Step into the hope of a victory that no one would ever believe. Join us. And together let us shout out a hope that will turn into a promise: Hosanna, Lord. Save us. Hosanna. Amen.